Rujak cingur is an East Javanese specialty. 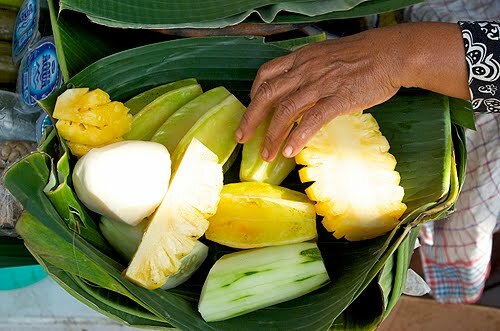 Rujak is a kind of fruit and vegetable salad popular in Indonesia and Malaysia that combines ripe and unripe fruit, along with raw and cooked vegetables for a crisp, tart and sweet explosion of tastes and textures on the tongue. Different cultures favor different combinations of ingredients and sauces, so the rojak made by Indians in Malaysia is a totally different beast from that made by Chinese in Singapore or Madurese in East Java. What makes rujak cingur unique, besides its liberal use of petis udang (a tar-like fermented shrimp paste popular in Java) in its sauce, is the inclusion of cingur--water buffalo snout. Boiled and sliced into bite-sized pieces, it adds an extra dimension to the rujak. According to my sister-in-law, Lili, this Madurese woman makes the best rujak cingur in Kediri. Not an aficionado myself, I’ll take her word for it. 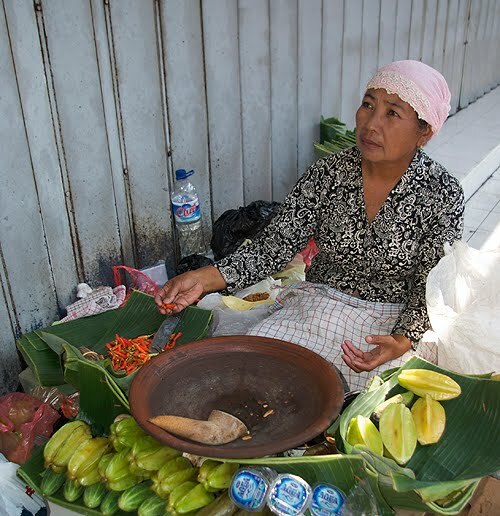 Typical of many hawkers in Java, she has no set spot from which she sells her rujak, but carries her makings with her and prepares each salad to order, deftly assembling a salad as she slices pieces of fruit and grinds her sauce to each customer’s preference of spiciness. Walking home from school after picking up my niece, we got several orders to go. Not a fan of spicy food, she watched to make sure no extra chilies were slipped into her order. Wrapped in banana leaf with the sauce kept separate in a small plastic bag, it made a perfect after school snack, nutritious and tasty. One of the things about traveling is that you don't have much opportunity to cook. As much as I enjoy going out to eat Indonesian food while in Indonesia, there are times I'd like to be able to cook something. I did make some pizza for my nieces--baked in a stove top oven using Kraft processed cheddar and lop xiong--which turned out better than I expected, but for the most part we've been eating out. My wife's favorite aunt (and mine on her side of the family) is a great cook. She is also a very kind woman who has always made me feel very welcome in the family. When we were here three years ago she made this dish for me and it blew me away. 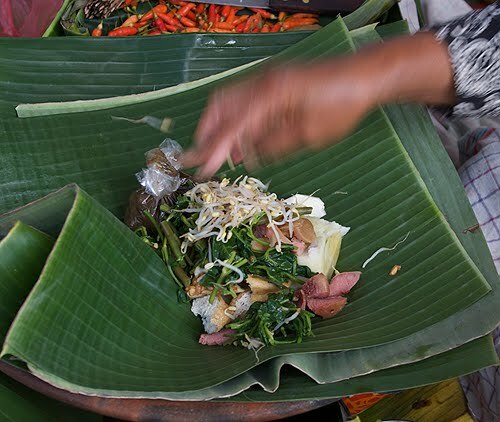 Like many Indonesian dishes, it is relatively simple but also complex in its flavors. It requires fresh ingredients and some effort in preparation, but is certainly worth it. It is Indonesian home cooking at its finest. I'll have to wait until I get back to the States to write the exact quantity of the ingredients. 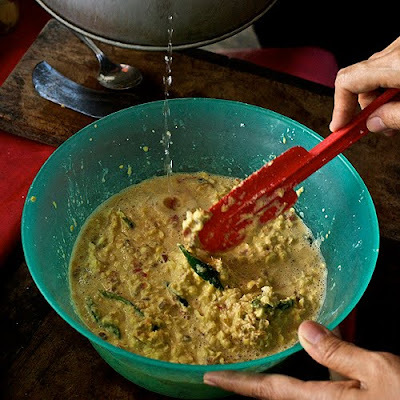 Corn, shallots, red chilies, green chilies, dried shrimp, coconut milk, over ripe tempe, salt, sugar, and a little water are mixed into a somewhat liquid paste, ladled into banana leaves that are folded into a packet and then steamed. The steamed packets taste like slightly funky, spicy fresh corn tamales. 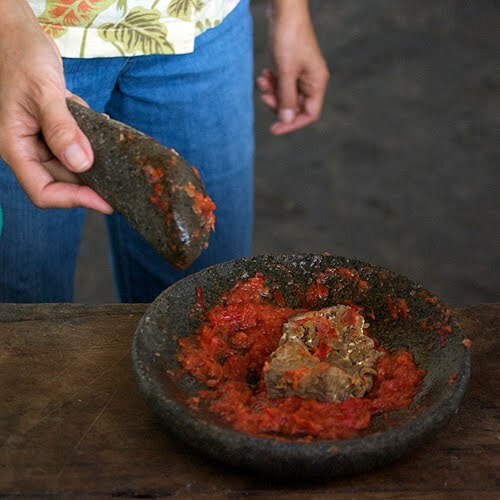 One ingredient you might have trouble finding outside of Indonesia is overripe tempe (tempe busuk). If you make your own, following this recipe, just let it ripen a little before refrigerating. The slideshow gives a pretty good idea of how to make this dish until I get around to posting a recipe. 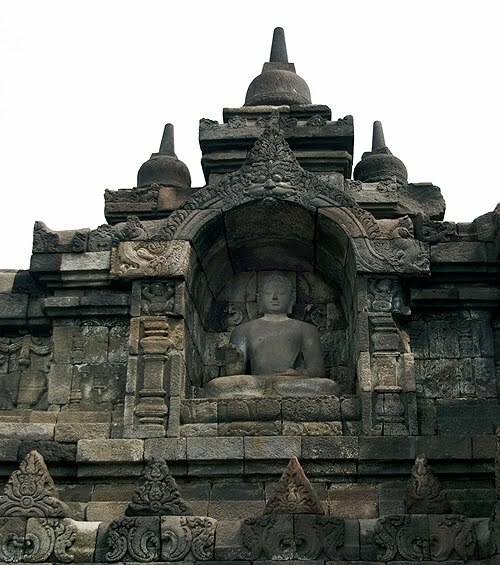 Borobudur is one of those places everyone should try to get to at least once in their lives. It is magnificent. I have been to it a half dozen times now and every time I am stunned by its beauty and sense of serenity. Even with thousands of people assaulting it and hawkers selling t-shirts, soft drinks, post cards and trinkets, it maintains its integrity. Built in the 9th century, Borobudur was constructed on a mound that apparently rose from a shallow lake plane, appearing like a lotus flower above surrounding water. It’s an amazing technological achievement, a massive mandala structure that appears like a small mountain in the distance. 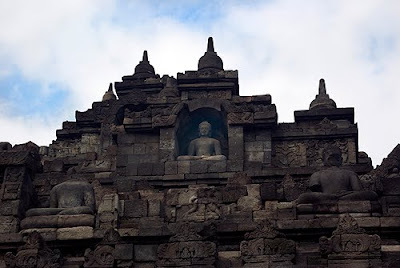 According to Wikipedia, it has 2,672 carved relief panels and 504 lifesize Buddha statues. While the accomplishment of its construction is amazing, the experience of visiting the site is awe inspiring. 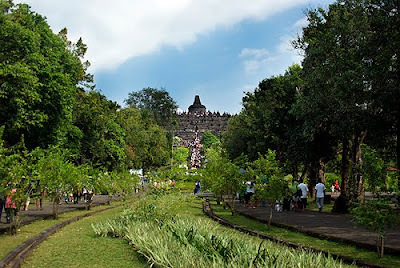 Entering the grounds to Borobudur ($2 for Indonesians, $15 for all others), you approach the temple down a tree-lined path. The first curve when the temple appears before you is incredible. Despite the thousands of people surging towards and clamoring over the stones, you can’t help but be stirred by the sight of Borobudur itself. A distant hill at first, as you get closer it appears to expand, becoming monumental. 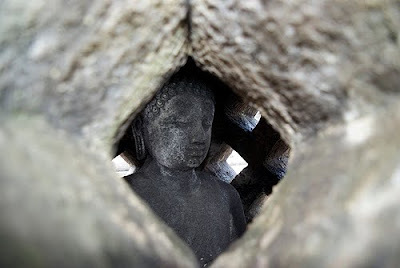 The temple was intended as a shrine and as well as a didactic device, instructing visitors on Buddhists beliefs as well as the life of Buddha. It has three levels, representing the world of desires, the world of forms, and the world of formlessness. The Wikipedia article gives a good explanation of the design and significance of the different levels of the temple. Rivulets of sweat ran down my nose. At each level I discovered a new degree of crankiness. By the time we climbed to the top level, the level of enlightenment, I was miserable. I could hardly take a step without brushing against another person, the heat from their bodies, from the sun above and the stones of the temple exorcising all the moisture from my body. 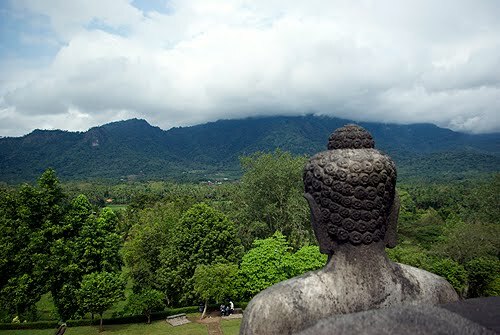 Despite the beauty and peacefulness of the temple, all I wanted to do was get down and away from the throngs of people. 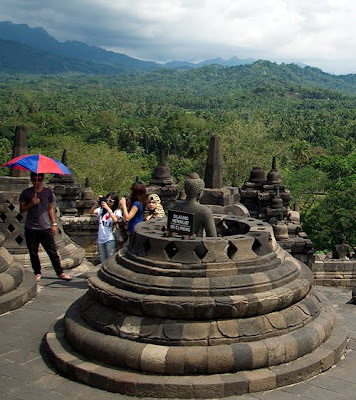 One thing caucasians should expect when visiting Borobudur is to have people request to have their photo taken with you. On my first visit in 1983, I was amused when groups of teenagers approached and asked me to pose with them and sign their notebooks. It has happened every time I have gone there. This time a group of school girls from Surabaya stopped me to practice their English. 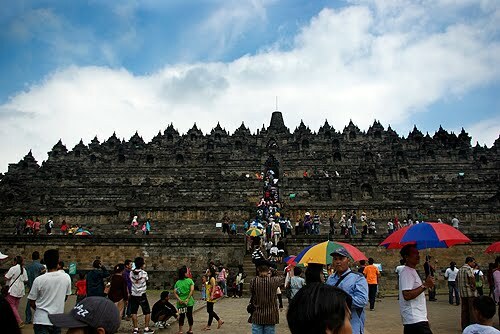 If you ever want to feel like a celebrity, Borobudur is the place to go. In the US, I try to avoid traveling on major holiday weekends. Memorial Day, the kickoff to summer vacation, and Labor Day, traditionally the last day of summer vacation for students, find the roadways packed with frantic families rushing to get away from or get back to their everyday lives. Drivers stressed by the dual pressures of whining children and clogged freeways take unnecessary risks. The news broadcasts keep a running account of traffic fatalities. Every driver other than myself is an idiot who should be shot and dragged from their vehicles, their bodies ripped open so that feral cats might feed on their livers. I am not one who travels those days. This past weekend was the last weekend before the end of school holidays in Java. Not thinking, I traveled. My wife and I borrowed her cousin’s car, hired a driver, and embarked on a simple, excruciatingly hellish roadtrip. Drivers and traffic in Indonesia do not bind themselves by the laws or the road. On a two-lane highway traffic flows in six directions. Buses, trucks, and cars think nothing of forcing motorcycles and pedestrians off the shoulder so that they might squeeze past a line of vehicles stupid enough to stay on the road. Motorcyclists use the opposite shoulder to pass, driving into a stream of motorcycles flowing towards them. Bus drivers in Java have neither souls nor mortal fears of death. They play chicken and never lose, forcing vehicles and pedestrians to give way to their passage. When I first came to Indonesia in 1983, I bought a Vespa and planned to ride around Java. Then I was on the bus to Surabaya one day and witnessed the conductor, who collects fares, lean out and push an older woman on a bicycle off the road, causing her to fall on the shoulder. He and the driver had a good laugh. I decided I’d just ride the Vespa around town. One way Indonesian dining establishments reduce the overhead of operating a restaurant is by eliminating the overhead. 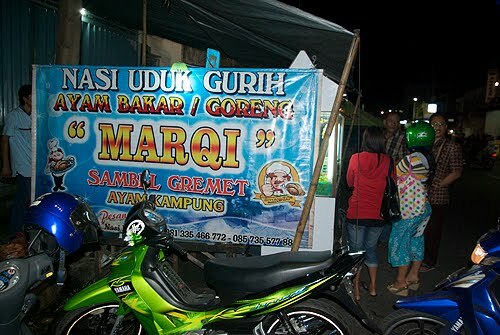 Long before the internet reduced the demand for brick and mortar stores, Indonesian restaurants took to the streets. In any town you can find established dining spots that materialize only in the early evening. Before that, they are merely parking spaces and open sidewalk. But come evening, the cook sets up his stall, sets up a few tables with stools and/or lays some woven mats on the sidewalk and is open for business. 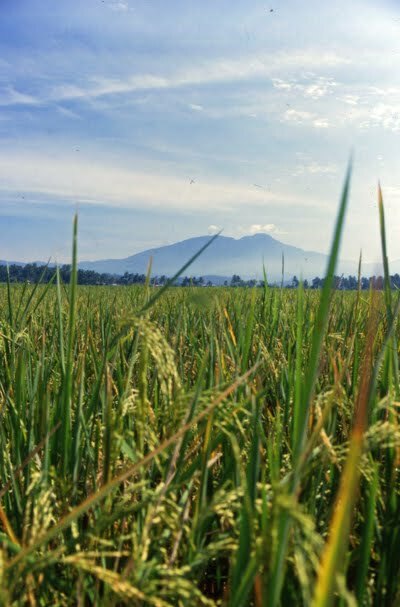 In a city like Kediri, with a population of around 300,000, there are probably at least a hundred stalls and pushcarts alone, not to mention warungs and restaurants, selling nasi goreng (fried rice). 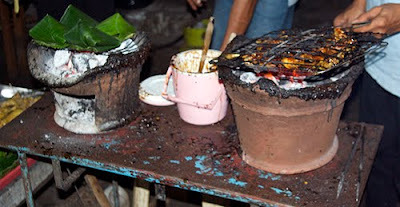 There are also stalls specializing in sate, fried tofu, pecel, fried chicken and grilled chicken, among other dishes. While to most people one plate of fried rice might not be that much different from another, like food everywhere, diners have strong opinions on who makes the best fried rice or grilled chicken. Each stall has its adherents. My sister-in-law and her husband are both natives of Kediri, so when they recommend a spot, I listen. Ayam Bakar Marqi has been in its present location for about six months. It's on one of the main streets in Kediri, across from Santa Maria Catholic school. While some places prefer meatier, chemically enhanced chickens, the folks at Marqi only use ayam kampung--village chicken--small, free range chicken that are not fed antibiotics and chemicals to color their skin. You can order a whole grilled chicken or quarters, either breast and wing or thigh and drumstick. 14,000 rupiah (about $1.50 US) gets you a quarter of some of the tastiest grilled chicken you can find. Its served with a sambal of fried shallots, a piece of lettuce and a slice of cucumber. 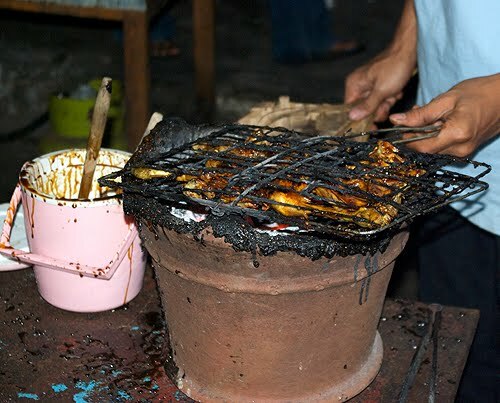 You'll also want to order a packet of nasi uduk (rice cooked in coconut milk) that is warmed over the grill while your chicken is cooked. The combination of grilled chicken and coconut rice is fabulous. 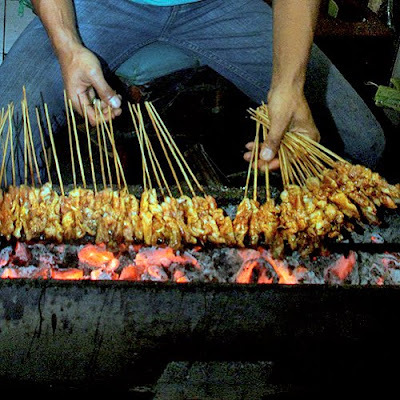 Indonesians are serious about their sate. There are numerous kinds--chicken and goat are the most popular, but you can also find beef, pork, rabbit, turtle, and dog, depending on where you are. And for each variety there are different interpretations. 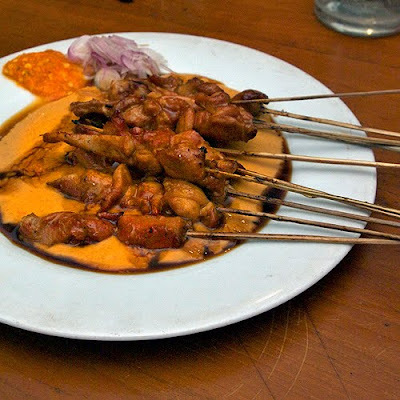 Sate ayam (chicken sate) Ponorogo is different from sate ayam Blora and sate ayam Madura. 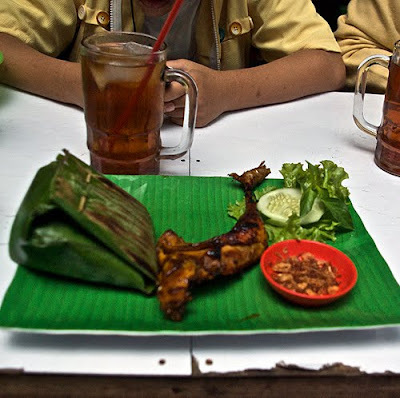 In my wife's hometown, Kediri, the local favorite is sate ayam Ponorogo, in particular Pak Siboen's interepretation of the dish. 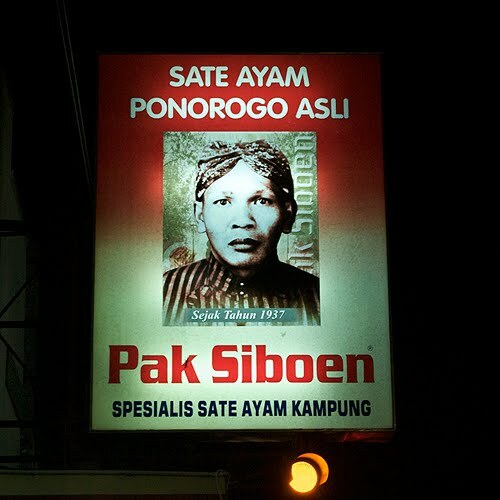 The sign claims Pak Siboen started selling sate in 1937, so he has a good track record. The original Pak Siboen is no longer with us, and this restaurant is operated by one of his sons. 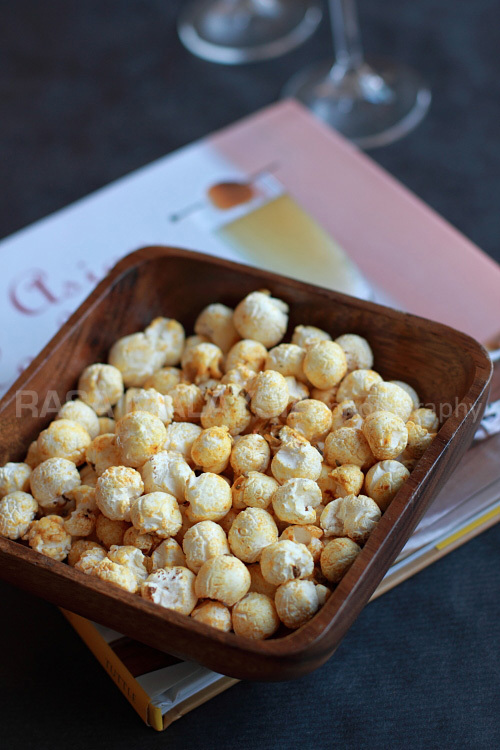 He opened it in 1954 and has also opened branches in Malang and Jakarta. Another child operates another restaurant by the same name two doors down, but the locals favor the original. Although I almost never disagree with my wife ;-), I am not as impressed with the sate here as she is. 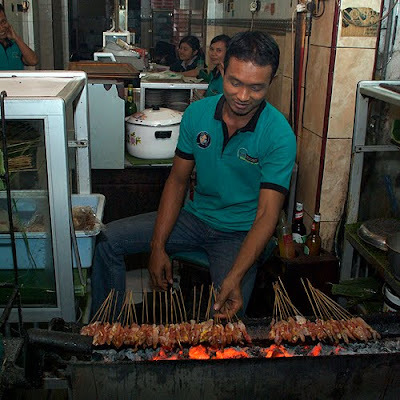 Perhaps it's because I am more a sate ayam Blora fan, but I find Pak Siboen's sate to be somewhat lackluster in taste. Still, 14,000 Rp (approximately $1.50) for ten sticks of chicken sate doesn't justify marital discord. 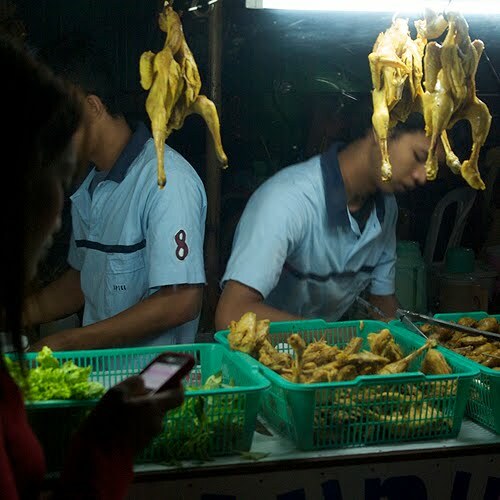 For 9,000 Rp you can get ten sticks of chicken skin sate, or liver, or gizzards. I'm a straight meat man myself. I prefer lontong to regular rice with sate, but they didn't have lontong the night we went. Being a halal establishment, bir is not an option among the beverages. For people like myself who don't like sweet soft drinks, I recommend es teh tawar (plain ice tea). It is available in virtually any establishment that has ice (and even the smallest warungs usually have ice) and is both refreshing and cheap. My first day back in Jakarta, a city I first came to in 1983, was spent in shopping malls and at church, two places I'm not known to frequent in the US. After a combined flight/transit time of about 32 hours before arriving the previous night, I hadn't planned to spend 8 hours in various stores before going to a 2 1/2 hour mass--dressed in shorts, flipflops, and a T-shirt--to say farewell to Jakartas cardinal and welcome his replacement. Apparently the cardinal had come to Jakarta the same year I had, 1983, and was to retire after 27 years service. We were there ostensibly to say hello to his personal secretary, Romo Padmo, the priest my wife and I knew from Pulau Galang, and who had married us in Surabaya in 1993. He, of course, was extremely busy arranging the mass and we could just say hello to him at the end. 27 years from when the cardinal and I first arrived, the airport is further from the city. There are more cars, more malls, more of a middle class yearning for more goods and services, but the heart of the city is the same. You wouldn’t confuse the traffic of Jakarta for the traffic of Kuala Lumpur or Saigon. The city consumes itself; new development blossoms in one section while older sections are collapsing upon themselves. It is a living organism that has compartmentalized itself. New malls sprout up offering KFC, Pizza Hut, designer clothes, and Starbucks while families live in shacks beside stinking canals of black water. Pramoedya Ananta Toer’s stories of life in Jakarta in the 50’s are as true a depiction of life in Jakarta today as they were then. While stuck in traffic, I noticed the billboard advertising a film scheduled to open the next day. Obama--Anak Menteng (Obama, Child of Menteng--Menteng is the middle class enclave in the heart of Jakarta where Obama attended school as a child). The film is advertised as an inspirational story for Indonesian children and opens during school holidays.